This did quite well and it certainly should have. This just pulls me into the scene to experience all that is going on. This is great, wish the background was a little less busy, otherwise a very emotive shot. Great photo with a good concept and composition. This picture is very well thought out, and was excecuted nicely as well. I really like the concept, but wish his back wasn't turned towards her. I love how this tells a story. and the Black and white looks great. Great idea location with just the one tombstone. A very morbid concept, but well done. Your ability to make it look this way with such limited editing amazes me. Well done. 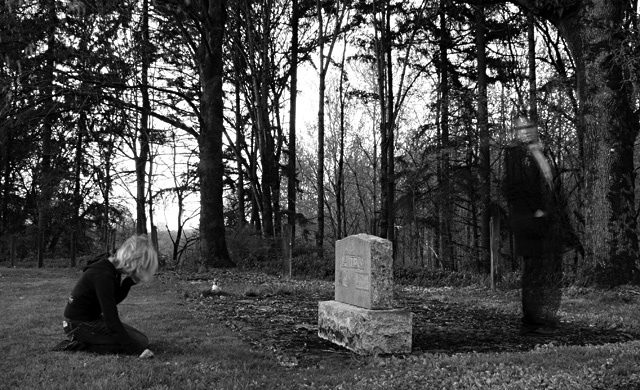 She should be closer to the grave so you could crop closer on everything. I also wish he were a bit more fleeting/see-through. Still a nice photo. i love this...the title, the emotions. its so sad! Neat idea. So many of us were haunting the graveyards last week. Such a sad photo. Well done! Proudly hosted by Sargasso Networks. Current Server Time: 04/21/2019 12:40:35 PM EDT.